Here is another photo that I took yesterday at the beach at Lynch Park. I noticed the seagull on the rock, so I decided to take a picture with my phonecam. 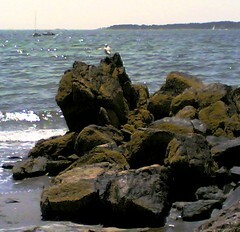 Later, I cropped the image and adjusted the brightness and saturation to make it easier to see the bird on the rocks. On a morning walk on the beach, Heather and I noticed a path that we had never seen before, leading uphill and away from the water. We decided to follow it, and it turned out to be a second entrance to the beach, and not such a well-kept secret, either. We have been to this beach many times, and have never noticed this path. 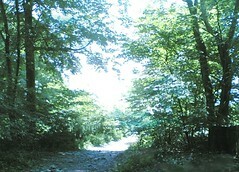 As we came to the top of the hill and the end of the path, I looked back and took a picture with my phonecam. I could just make out the ocean through the trees. Tonight when I loaded the image into the computer, I realized that the brightness of the sunlight made it impossible to see the ocean in the photo. But I really liked the image anyway, so I opened it in Painter IX and cleaned up some litter in the foreground with digital pastel. While I was at it, I added a little transparent blue to counteract the brightness of the sky and to suggest the position of the water. (Trust me; this path leads down to the ocean.) This little adventure was the bright spot in the day, and a good reminder that even when you think you know all there is to know about a situation, pay attention anyway, because you might just find a new path that you had overlooked before. Here is a nice memory of my first trip to Portugal. 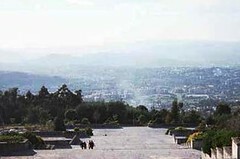 We were driving to see the sites in the area and stopped to take in this panoramic view of the area around Braga. Tonight I cropped the image and adjusted the color to focus attention on the view beyond the trees. We have been having problems with internet connection for two days. So tonight, after a really strong thunderstorm, Mel and I headed over to the computer store. Although the thunder and lightening had stopped, it was still raining hard. 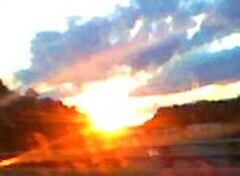 But the sun was going down, and as we approached Danvers, the sky was beautiful. I wanted to take a picture with my phonecam. The car was bouncing along, the windshield wipers were going, and I forgot to turn off my flash. Just one obstacle after another, which is the way the day seemed to be going. But when I loaded the pictures into the computer, I liked some of the effects in the photography. This image was a happy surprise. In college, I learned about Raku pottery with its emphasis on using accidental effects. ( I guess I would consider this Raku photography.) I decided not to change anything about the photo, except that I cropped it just a bit to move the bright yellow and orange area out of the exact center of the image. 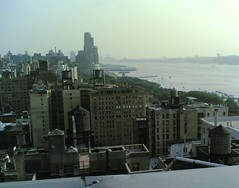 Here is another photo that I took last week in New York City with my phonecam. You get a different view of the city from the rooftop. 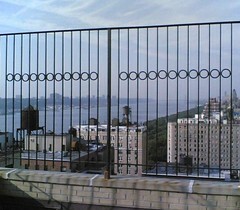 Last night, I cropped this photo to improve the composition and emphasize the diagonal of the Hudson River. I am going to my high school reunion next week, so I had a hair appointment scheduled for today. George cuts my hair and he is the best! 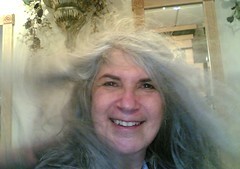 While George was drying my hair, I started taking pictures with my phonecam. George decided to have fun too, and helped me by creating some special effects with the hair dryer. This is my favorite of the pictures I took today. We drove up to Maine tonight to have dinner with a visiting relative from out of town. Just about sundown, we were waiting for a table at the restaurant, so I took this picture with my phonecam while we were waiting. 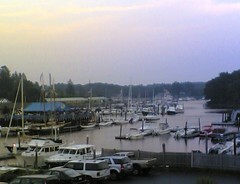 Later, when I got home, I edited the image to focus on the boats, the water, and the lines of the trees. Some of the crabapple trees are starting to produce fruit. 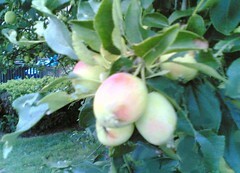 I was excited to see this tree, with its yellow and pink baby apples, so I took a quick picture with my phonecam. When I saw the image on the computer screen, I realized that I was in such a hurry to take the picture that I didn't notice that the crabapples had been pecked at by birds and the leaves had been chewed on by insects. So I opened the image in Painter IX and used digital pastel to cover the flaws that were distracting. I guess you could say that this image is not true to the original photograph that I took, but it is true to the way the crabapples looked to me when I grabbed my camera to take the photo. 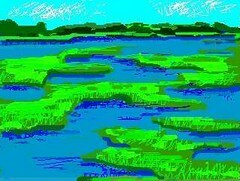 Yesterday I posted a sketch of a Connecticut marsh that I created on my handheld Clie while I rode the train back to Boston. So tonight I am posted another view of the same subject. I took this photo with my camera phone. My sketch was just a quick impression of the scenery that was flying by; the train was moving far too fast to really draw from observation. This photo gives you an idea of what it really looks like. Tonight I cropped this image to make it square, like the sketch, and adjusted the color to overcome the effects of taking pictures through a train window. On the train back to Boston from my recent trip to New York, I took lots of pictures with my phonecam (great views of the water). But I also made one sketch with my Clie (handheld computer.) 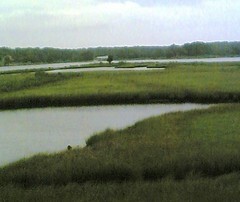 I sat in the the cafe car, and sketched the salt marshes in Connecticut. Tonight I transferred the image into my computer, opened it in Painter IX, and cleaned it up with a little digital chalk. 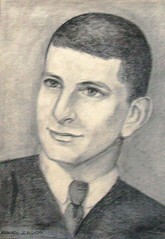 I did this drawing of Mel back in the sixties, from his high school graduation photo. That means I did this as a sophomore in high school. (He was two years ahead of me in school.) You can see the signature says Randi Zagon (my maiden name). Mel went to South High School, while I went to Pueblo Central. I turned this drawing in as an assignment in my high school art class (can you believe that? ), and I remember that Mr. Corty, the art teacher, put it in the trophy case in the hallway as "plate of the week". So that week, we had a South High senior on display in the trophy case at Central. Well, that seems like a long time ago, but some things don't change. (For example, I still love to draw portraits, and Mel is still older than I am.) Today, I took a digital photo of this drawing, and used Painter IX to clean up the image and "repair" a tear in the paper with some digital chalk. I am posting it today in recognition of Mel's birthday, which is no secret, because he announced it on his blog already. Yesterday I took the train from Boston to New York City to visit my aunt. We were having a very quiet afternoon, looking at old family photographs, which I love to do. It was too hot to walk around the city, but we went up to the rooftop patio of the building instead. The views of the city were amazing! I took lots of pictures with my phonecam, and this is one of the best scenic views. You can see across the Hudson River all the way to New Jersey! It just goes to show you that when you are in New York City, you don't have to travel far to have an adventure. Last time I visited my aunt in New York City, she showed me a paint-by-number set. I hadn't seen one of those since I was a kid. 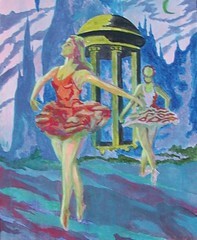 She invited me to paint, and I said, "Well, okay, but only if I can make it a subversive paint-by-number." I started to paint while we talked, making the color choices arbitrary rather than realistic, and keeping the paint as transparent as possible to let the numbers show through. I wasn't finished when it was time to leave to go back to Boston, so my aunt told me to take it home and finish it. I've been working on it, on and off, and finally finished it today. Once I had all the shapes filled in, I used some transparent washes of color, crossing the borders between the original shapes. In just a few hours, I am catching a morning train to visit my aunt in New York City again, and I am going to take this little subversive paint-by-number along to give to her. Here's a photo from yesterday's excursion to New Hampshire. I saw these trees near our friends' new home. 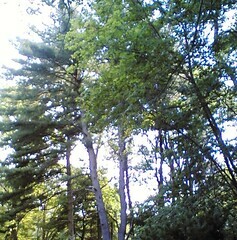 I loved the contrast of bright green leaves against dark green shadow, so I took a picture with my phonecam. Today I cropped it to improve the composition and adjusted the contrast just a bit. Yesterday I went to New Hampshire with Mel. 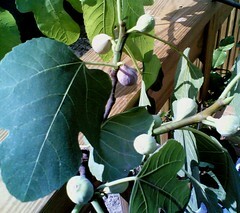 This fig tree belongs to two new faculty members at UNH who are moving in to their new place. I had never seen a fig tree, so of course I decided to take pictures. This is the best one. I decide to post it today because the timing is right to consider the fig tree. What was that line again? Something about sitting under a vine and fig tree, something about swords beaten into plowshares, something about studying war no more, something about no one being afraid. . . .
Tonight I cropped a photo of Pueblo, taken on my most recent trip, to produce a view of the town with the mountains in the distance. Then I opened the image in Painter IX and used some digital chalk to add some subtle color. 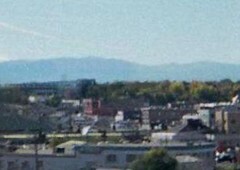 Although this image has been digitally edited, the backdrop of the mountains is as I saw it growing up. The soft, grainy image seems right for a memory. I am posting this in view of the New York Times piece on Pueblo,* and my upcoming time-travel to attend my high school reunion. 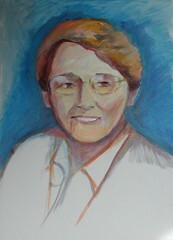 Today I worked for a bit on my latest portrait. 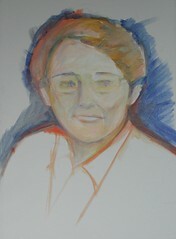 This is still in the very early stages, underpainting with thin layers of paint. Today, I focussed on compositional issues. Because this portrait is one of a set of two paintings, I am trying to make sure that the placement of the figure in this painting will look right when it is next to the other portrait that I already finished. Then I also worked on placement of the facial features, and made some corrections to body position and face shape, without worrying too much about getting a likeness at this point. That will come later (meaning getting a likeness will come later, and so will worrying about it). This week I have been doing some early morning yard work, and then drinking my coffee outside. I love to see the morning light on the trees. Here is a picture I took with my phonecam this week. I saw these marigolds at the supermarket. It is late in the season to be thinking about planting, so these flowers are on sale. I love the color, so I took some pictures with my cameraphone. When I got home, I edited the pictures in the computer. I like this one the best, and decided that the purple and gold flowers in the background add contrast. 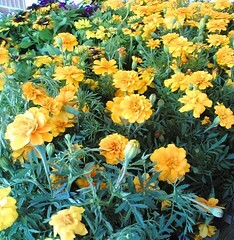 Maybe it isn't too late to plant marigolds after all. Maybe too late is just a state of mind. I have been doing a pencil sketch to get ready to paint a portrait, and today I got started, finally. I didn't have much time to paint today, but at least I blocked in the composition and the placement of the face and figure. This is just underpainting, very rough and very early in the process, but it feels good to get started. We had great weather this morning, but heavy thunderstorms all afternoon. After the storms ended, it was foggy. Around 8 PM, the light was beautiful, so I went out to take a little walk. Here is a picture that I took with my cameraphone. This is a photo I took sometime this week with my phonecam. I had forgotten about it until I transferred some images into my computer tonight, and then I saw it again. I took this photo during a late afternoon walk. 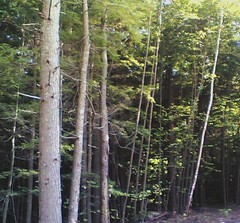 You see these trees growing wild along the highway, and I guess some people would call them ordinary, but I disagree. 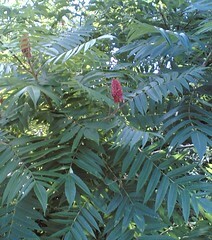 I love the patterns of the leaves, and this time of year, they make an amazing red blossom, as in this photo. 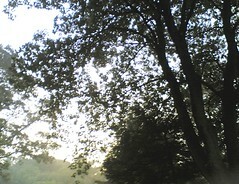 So I took a picture, trying to capture the feeling of the late afternoon sun behind the leaves. Tonight I cropped the image to get the composition the way I wanted it. Today the New York Times travel section featured Northern Ireland, so I decided to take another look at the photos I took while I was there. This one was taken during my trip to Northern Ireland just about this time, summer before last. Mel took me to see the Giant's Causeway, which is probably the most well-known tourist spot in Northern Ireland. 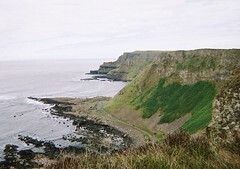 (In fact, a lot of tourists aren't aware that they are in Northern Ireland when they are at the Giant's Causeway.) But before showing me the famous rock formations at the shoreline, Mel wanted to show me the view from the top of the cliffs. Now, I like walking, but not hiking, and am not crazy about heights. But it was certainly worth it! This is one of the pictures I took up there, looking down at Giant's Causeway and the Irish Sea. If you get a chance to travel, don't overlook Northern Ireland! For exercise this morning, I did yard work. 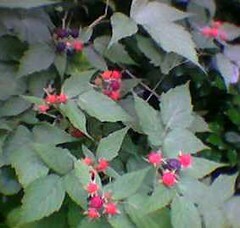 Raspberries like this are growing everywhere. They have been growing like crazy because of all the rain. I know I have to pull some of them up because they would overtake the whole yard, and they do have pretty good thorns on them too. But still I love the color and shape of the leaves, and the beautiful berries, so I am going to leave some of them growing by the back fence. This is a picture that I took last year with my old phonecam. Tonight I cropped the photo, and then adjusted the contrast to try to make the image clearer. 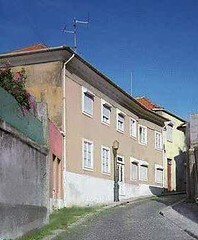 Yesterday I posted a colorized version of a street in the Foz in Porto. Here is the same photo as it looked before I added any color. It is fun to add color, but it also can help make the shapes show up more clearly. Here's another little glimpse of Porto. It was a fantastic morning indeed, but the title also refers to the fact that I have colorized the image and taken liberties with the color. This image began as a quick photo that I took early one morning of a little street in the Foz in Porto during my very first visit. Tonight I cropped the photo to get this image. I liked the view of the street with its patterns and shapes, but I decided to enhance the color just a bit. Lots of the buildings in Porto are muted pastel colors, and in the Foz, faded with time. I decided to brighten the color, to get an idea of what this might have looked like when the colors were new. I opened the image in Painter IX and used transparent digital pastel. First, I used slightly brighter colors that were already in the image. Then I pushed the gray towards muted violet, and added just a bit of bright pink on one building. I used just a touch of bright pink on the foliage above the wall, so the suggestion of bougainvillea is part of the fantasy. This image is not true to the colors of the original photo, but it is certainly true to the excitement of finally being in Portugal. I was looking for an image of a sunset today and came across a picture that I took last summer as we were driving home from a wedding in Maine. I took the photo from the passenger seat of a moving car. 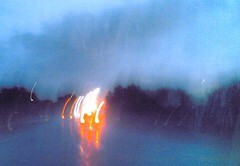 The phonecam I had last summer was lower resolution than my new one, but sometimes it produced interesting effects. The photo is full of technical problems such as glare, blur, and reflections, but when I looked at it again tonight, I decided that I like it anyway. So I cropped the image for the sake of composition, then opened it in PainterIX and toned down one distracting reflection with some opaque chalk. In art (and in life), it pays to see past the problems and focus on the possibilities.. In the summer, I like to take walks in the morning. Here's another photo from yesterday's excusion around the neighborhood. I liked the colors and textures, so I used my phonecam to take a picture. Tonight I cropped the image to improve the composition. 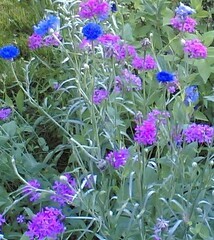 I saw these flowers on a recent morning walk, and took a photo with my phonecam. I liked the way the flowers were still just opening up in the morning light. These flowers are blooming now all over the neighborhood. 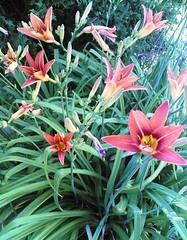 My grandmother used to call these tiger lillies. I am not sure if that is the right name, but they sure do bring back memories of the house where I grew up. Tonight I cropped the image to focus on the flowers, and corrected the color just a bit. Seeing cherries in a bowl always makes me think of the song ("Life is just a bowl of cherries") and this is a good reminder not to take things too seriously. 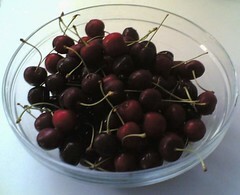 I love cherries, the way they taste, and the way they look. Here's a recent photograph that I took with my phonecam. Then I cropped this image to square the circle. Yesterday I went for an with an evening swim with my daughter. As we were leaving the pool, the sun was going down. 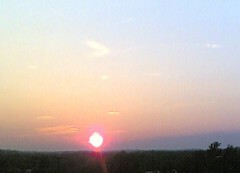 The sun looked bright red, so I took a picture with my phonecam. Later, I cropped the photograph to focus on the sun just above the horizon.